The 100-meter sprint is a short-distance race in which runners compete on the basis of individual speed and acceleration. The race is generally not considered a measure of stamina due to the short distance, though the Olympic winner often snags the unofficial, but distinguished title of "Fastest Man/Woman in the World." Also known as the 100-meter dash, the race is governed by rules that are only somewhat different from 200- and 400-meter races. Runners line up side by side at the start of a 100-meter track. This can be an indoor or outdoor running track, such as those found at indoor gymnasiums or around sports fields, or it can be an improvised stretch of road, sidewalk or other flat ground. The start of the race is signaled by firing a gun, at which time all runners begin to sprint toward the end of the track. Because wind can either slow or aid a runner, official outdoor races take place under strict weather conditions. If the wind at the runners' backs exceeds 2 meters per second, conditions are judged inadequate to set a record. A lower tail wind is considered "wind legal" and the runners' times are eligible for records. Races run at altitudes greater than 1,000 meters above sea level are marked with an "A" to denote the advantage runners have at these heights. This is because the thinner atmosphere creates less air resistance for the runners. You experience a false start when you begin running before the sound of the gun. You may leave the blocks or starting line early for a number of reasons, but this is usually due to a state of over-excitement at the start of the race. After one false start, the runners are returned to the starting position and asked to begin again. If you make two false starts, you are disqualified from the race. You must run within your marked lane throughout the race. Lanes are typically marked by painted lines on a running track, but in an improvised setting they can simply be assumed boundaries that are judged by sight. Leaving your lane can be dangerous, as it may cause you to interfere or collide with another runner at high speed. Any time you leave your lane, you are immediately disqualified. The rules state that the first runner whose torso crosses over the finish line is the winner. Only the torso is considered in judging the winner. Crossing the line with your head, arms, legs or feet before another runner crosses with her torso will not help you win. 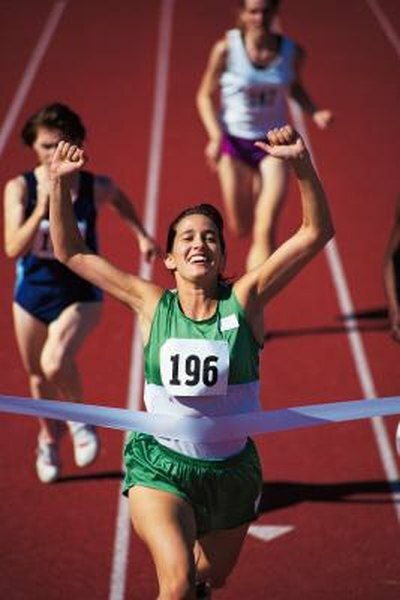 In close races, it can be difficult to determine the winner by sight, so a thin banner or tape is stretched across the finish line. This technique makes it easier for officials to see which runner makes contact with the tape first. At the 2012 Olympic games, Jamaican runner Shelly-Ann Fraser-Pryce got gold for crossing the line in a 10.75 finish in the women's 100M. IAAF: Bolt again! 9.58 World record in Berlin!